her little boy (who is now a grown man) a ciambellone so he would not be eating the commercially made merendine. 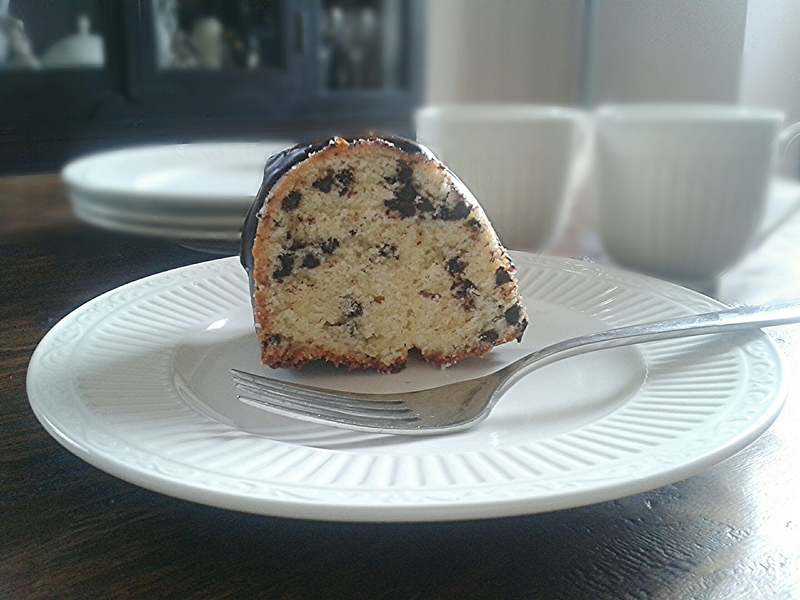 A ciambellone is, in essence, a bundt cake. A merendina is a packaged sweet snack (think: Ding Dongs, Twinkies, Ho-Hos). Kids eat them when they come home from school and sometimes even for breakfast. Anyway, hubby’s aunt said she was not too thrilled with her kid eating that processed food and decided to make this cake once a week, so her son could still have a sweet snack, but this way at least she would know what he was eating. This woman totally inspired me to get baking. At the same time, anyone who knows me well, knows I can’t really bake. In fact, at Christmastime when I lived in the same city as my sisters and we would get together to make Christmas cookies, we would all decide who was going to make what, and I was usually on the receiving end of this phrase: “Ummmm, Diana, why don’t you make the run balls.” Get it? No baking involved. Anyway, the point is – that if I can make this cake – ANYONE can make this cake. I tried to keep up with the Italian aunt and make this cake once a week, but I as always, the Italian women have some secret of time I do not understand. Where they get the time to cook and clean in the way they do? I have no idea. But once every two weeks it is totally doable. This particular cake is called Ciambellone alla Stracciatella, which just means chocolate chip bundt cake, but doesn’t Ciambellone alla Stracciatella sound so much more exotic and beautiful? Here is recipe – enjoy! 2. Beat the butter, sugar, salt and vanilla extract together until combined and fluffy. 3. Add the eggs one at a time and beat after each addition. 4. Add baking powder and then add the flour and alternate with adding cream. Mix until smooth. 5. Spoon enough batter into the prepared pan to cover the bottom of the pan. 6. Add the chocolate chips to the remainder of the batter and mix well. 8. Bake the cake for 55 to 60 minutes or until a toothpick inserted into the middle comes out clean. 9. While the cake is baking, prepare the ganache glaze. In a small saucepan, bring cream to light boil. While cream is heating chop chocolate into pieces. Once cream is boiling, remove from heat and add the chocolate pieces into the cream. Mix until all of the chocolate is melted. 10. Remove the cake from the oven, and let cool. After completely cooled, remove from pan and place the cake out onto a rack. 11. 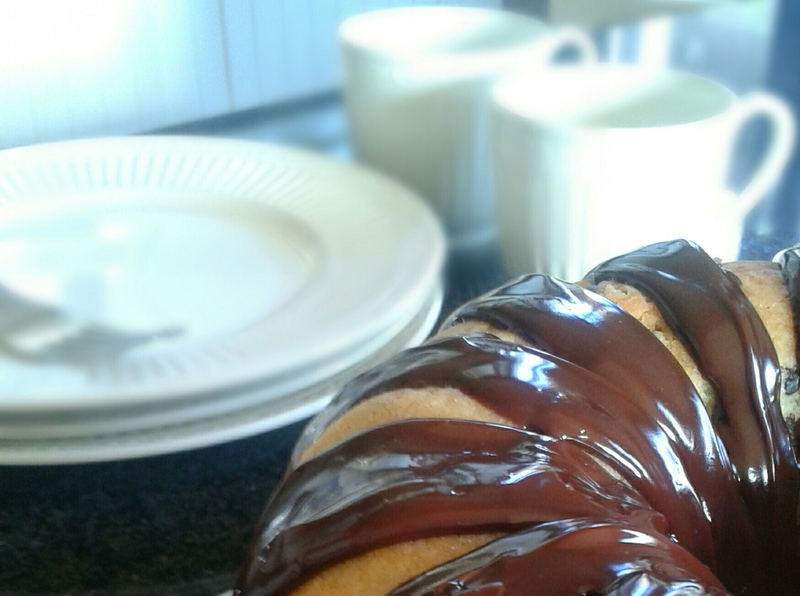 Drizzle cake with the chocolate glaze and let stand for 30 minutes. 12. Slice, serve and enjoy! Si…..la zia di mio marito e’ proproprio brava! Yum…versione light would be a good option for a merendina per me! 🙂 Buon Anno! Wow this looks amazing, delicious recipe! Thanks!!! It is also soooo easy!!! Have a good weekend! If you are not a baker then I don’t even know HOW to classify myself! Maybe I will try to make the ganache and just dip oreos into it? Love you, Bestest Frind! Well yum and yum AGAIN…your Oreo idea sounds delicious!!! Love you too! Have a good weekend! You “know a guy!” Ha, ha, ha, ha….fabulous!!!!! Happy New Year to all of you!!!! I suspect you are not alone in doing that 🙂 I think we all do that! Oh I fancy this one!! I agree with your husband’s aunt: merendine are rubbish but they still seem to be very popular in Italy. In the 80s it was the boom of merendine; industries used to bombard us with advertisements saying how healthy and good they were for children; even my mum, who used to cook all the time eventually gave up and by the time I was a teenager and my sisters where young she filled the cupboards with them. Our freezer was well stocked with industrial ice cream and cornetti too. Now of course she doesn’t but times have changed and thankfully we all know better. Hi Alida! Thanks for the message…yes…my hubby is still always buying merendine…. (we continuously war over this issue – – – but he likes to please – – so if the kids want it, he is gonna get it…he is just that kind of guy) 🙂 Ha ha, ha…he loves to get the cornetti too! GOSH! Anyway…luckily for me, he loves the cake, and it comes out every time. ANYWAY…..yes…great start to the new year…..and looking forward to 2015. Best to you too! Ha, ha, ha….I know…..kinda difficult to go wrong with the chocolate drizzle! 🙂 Thanks for the comment! Merci beaucoup pour cet article, c’est vraiment très clair et très utile ! Merci pour le genre de commentaire. Désolé pour mon français, je ai dû utiliser Google Translate, mais l’espoir de prendre une classe française l’année prochaine! Bonne journée! Hi Katie – – -I know….hubby’s aunt got it right. I cannot keep up with the weekly thing…..but try to balance homemade with store bought as much as possible. Thanks for stopping by and have a good week! I am planning to visit Rome in April (fingers crossed), it will be my second visit actually – after so many years :D, is it common to order Ciambellone alla Stracciatella as dessert? When Italians usually eat this cake? Hi Indah! Thanks for your message…somehow I am just now finding it. Anyway…..this is a cake usually made at home. Not sure you would find it at the cafe or pastry shop. Anyway…have a FAB trip to Rome. My hubby is Roman…so if you need any help planning your trip, let me know! ha, ha, ha….I am a lousy baker too……but somehow this cake always comes out…..that is why I love it. 🙂 Have a good weekend! Grazie! Devo dire che e’ molto facile da preparare! Vieni buono ogni volta. Buona giornata anche te! yay…fammi sapere come va! Buon weekend!